Musings about Faith: Reflections on the Gospel - "Faithful Thomas"
Poor Thomas. Over the last 2000 years we have come to know the disciple Thomas as “doubting Thomas” because of this episode in the Gospel of John. “Unless I see… and touch… and place my hands… I will not believe,” says Thomas. One can hardly blame him. After all, the other disciples have not exactly been paragons of faith. Judas betrayed Jesus, Peter denied he even knew Jesus and the others? Well, our text tells us they are hold up in a secret room hiding with the door locked! Not exactly a testimony of great faith. These disciples (or at least some of them) had seen Jesus tortured and crucified. They knew he was dead. They had seen him do amazing miracles including raising Lazarus, and they had heard him predict his own resurrection. But we have noted throughout Lent that they really didn’t seem to pay much attention to that. And affecting ones own resurrection is quite a different matter. These disciples didn’t believe anymore than Thomas. In Mark’s Gospel Jesus picks a knick-name for the disciples and he calls them “Little Faiths.” This moniker seems appropriate for the Gospel of John as well. But what exactly is faith? Does faith consist in accepting and believing extraordinary things that would otherwise be unbelievable? Is faith completely a mental exercise? Is faith in Jesus solely accepting the veracity of a series of incredible stories of miracles and signs – including the resurrection? Is that what faith is? I’m not so sure that this is faith. It seems more like mental gymnastics to me. In the Old Testament and in the Gospel of John there is no noun for the word “faith.” It is always a verb. It is always an action. The point of the miracles and the signs of Jesus and the resurrection itself is not to encourage us to sit back in our arm chairs and ponder whether or not we can find enough credulity to “believe” these stories were historical fact. Rather, they are to lead us to act; they are to lead us to live lives that imitate and reflect the love and teaching and miracles of Jesus. Mental attitudes are not even important. Ultimately God creates faith. And as we act and we live lives that reflect the gifts of God’s love and grace; that reflect the crucifixion and the resurrection of Jesus then God instills and creates faith. 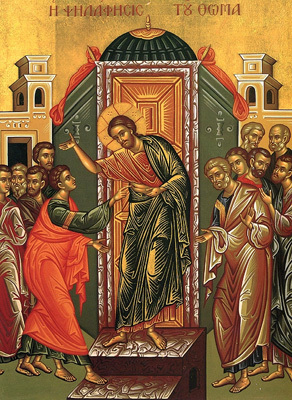 Thomas finally gets what the other disciples get: a personal encounter with the living Jesus. And it makes a difference to him, and it makes a difference to the other disciples. They eventually unbolt their locked door and go out into the world sharing the Good News that Jesus is raised and that the powers of death and darkness are defeated. We too are called to get out of our armchairs, unbolt our doors and live lives that reflect this amazing Gospel of Jesus, crucified and risen! For a long time I've thought Thomas was given short shrift by too many homilists, who often suggest that any kind of doubt is a weakness. But, as you point out, only Thomas of the eleven remaining disciples had not seen the resurrected Jesus. Elaine Pagels, in "Beyond Belief," suggests that this story is an attempt to discredit Thomas and the sayings gospel that bears his name. Yet I don't see anything in the story that discredits Thomas. Thank you for putting the Thomas story in perspective. P.S. from 2004 through early 2009, I was a ticket clerk at Normal, and attended St. Matthew's Episcopal when I didn't have to work.